It’s a temptation that lures almost all marketers and salespeople: the desire to limit and control information to consumers. It seems so obvious – lead with your best attributes, downplay your least. Yet in many cases, this impulse turns out to be quite wrong. Common sense would suggest some information—a car’s age and mileage—is essential, but that total transparency about other things (precise details on subpar paintwork) might deter buyers, and lower auctioneer commissions. [Two researchers] set up a trial, randomly splitting 8,000 cars into two groups. The first group were auctioned with standard information, including age and mileage. The second had a detailed report on the car’s paintwork. The example is from an article about insights that micro-economists are bringing to business, but you don’t have to be an economist to get it. Our trust in the seller, as well as our trust in the product, is increased when we know we have access to all relevant data. (Many) years ago I coordinated MBA recruiting for a small consulting firm. Our competitive offers fared poorly in terms of acceptance against BCG, Bain and McKinsey. Then I had an idea. We had a worldwide partners’ meeting scheduled in Boston during recruiting season. I arranged for a select group of MBAs from Harvard and Sloan to have cocktails and dinner with all of our partner group (about 30 people at that time). The pitch was, we were the only firm who would offer 100% access to all partners worldwide. Now, MBA students are not nearly as risk-seeking as they’d like you to believe – not, at least, about their first job. It turns out that the promise of transparency removed lots of perceived downside risk, and our acceptance rate soared that year. The biggest fear consumers have of salespeople is that the salesperson will manipulate or mislead them – so their default position going in is mistrust. The early phases of a buying decision are also the times when the buyer has the least amount of information. In other words: salesperson suspicion is highest when the customer has the least data. The answer seems obvious: make all relevant information easily available to consumers, in a manner which they control, and which minimizes the chance of manipulation. Your website, for example. Having self-educated, consumers will then seek out salespeople for advice that goes beyond the data (does this work with Windows XP? can you customize it for wholesale grain distributors?). And this time, the interaction is near-free of suspicion. The success of both inbound marketing and content marketing give evidence of the increasing use, and success, of this simple insight: transparency in marketing and sales helps all parties. 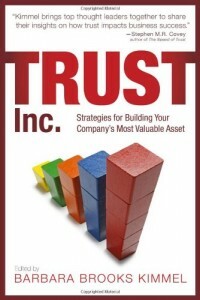 Good marketing and sales are enhanced by following trust principles, not by avoiding them. What’s good for the buyer is good for the seller too.